Real cotton pod angels are made here in the USA! *Ribbon color comes in red, green, white, gold, pink, and blue. Color ribbon will be selected randomly unless other wise specified in the options listed. Please note, some angels come with faces as shown and some do not. Please specify in the check out comments if a particular style is preferred. Resin ornament featuring the famous Rainbow Row homes on East Bay Street. Approximatly one inch tall by 2 inches wide. This ornament is pewter and features the Palmetto tree. Approximatly 2 inches wide and 1 1/2 inches tall. 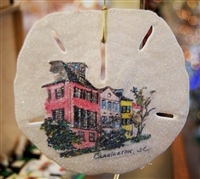 This ornament is pewter and features the famous Rainbow Row houses located on East Bay Street. This ornament is approximately and 1 1/2 inches tall and 2 inches wide. Hand made in Charleston, SC from real cotton! This ornament is approximately 5 inches tall.